In 2009, TWR approached us about helping them update their recruiting displays. Working together, we created a 2-sided display for either the small or medium size. Their new recruiting displays were first used at Urbana 2009. 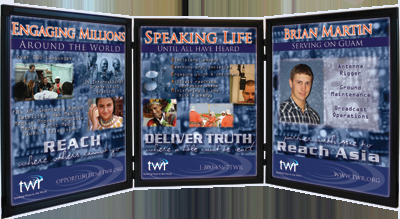 In addition, TWR missionaries now have the option of purchasing similar displays with a personalized panel for use in their own speaking engagements.